Living With a Wild God by Barbara Ehrenreich, reviewed. Barbara Ehrenreich searches for transcendence. Barbara Ehrenreich’s new book about God arrives in devilish packaging. First the title, Living With a Wild God, intimating secular Cheryl Strayed-style reckless abandon tamed by spiritual fervor. Then the cover art: a blaze of neon yellow spikes on a black background, a lifetime of darkness illuminated by a sudden, blinding flash. One might imagine being in the presence of a certain kind of aspirational bestseller, one like Proof of Heaven, about a cocky neurosurgeon (read: slave to rationality) who wakes up from a coma certain that heaven and God exist. Only this about-face would be even more sensational. Could Barbara Ehrenreich, fourth-generation atheist, proud socialist, and mocker of brightness and smiles, have found religion? Dream on, Billy Graham. Even in America you can’t go from hating pink ribbons to loving Jesus in the span of five years. Yes, this book recounts a spiritual journey with all the touchstones of the saints—a shattering mystical moment in the desert, a dark night of the soul, a painful personal reckoning. Yes, it’s disorienting to read Ehrenreich write phrases such as “savaged by a flock of invisible angels.” But her testimony unfolds in jagged order and lands in an unresolved place. By the end, when she still insists, “I believe nothing,” you might feel cheated of the cheesier but more emotionally satisfying version of events. 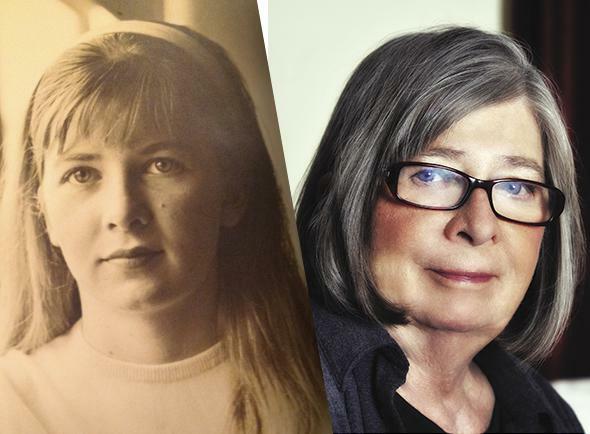 Barbara Ehrenreich as a teenager, and today. Photo courtesy the author, courtesy Peter Abzug. The world flamed into life. How else to describe it? There were no visions, no prophetic voices or visits by totemic animals, just this blazing everywhere. Something poured into me and I poured out into it. This was not the passive beatific merger with the ‘All,’ as promised by the Eastern mystics. It was a furious encounter with a living substance that was coming at me through all things at once, and one reason for the terrible wordlessness of the experience is that you cannot observe fire really closely without becoming part of it. 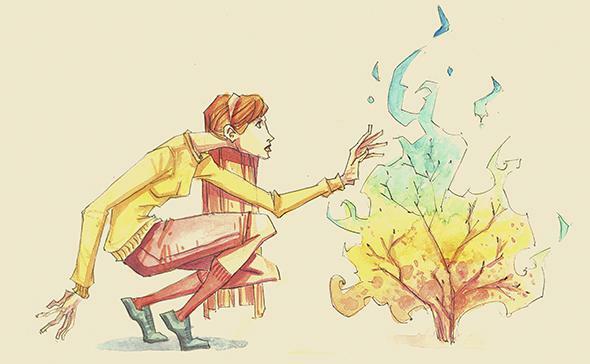 Whether you start as a twig or a gorgeous tapestry, you will be recruited into the flame and made indistinguishable from the rest of the blaze. Who knows, maybe It is? But before we fund the NIH panel, I’d like to propose an alternative arrangement for the events of Ehrenreich’s life. Mystical experiences are indeed common and widely accepted. You can read about them in any book on the life of the saints; William James included a chapter on them in The Varieties of Religious Experience. But a mature mystic understands that they are a spiritual error, even a potentially dangerous one. There is a famous story of a Buddhist monk who encounters one of his acolytes looking dazed, drained, and also ecstatic. The acolyte tells him he’s just been consumed by a flame. (There is almost always a flame in such stories!) The senior monk looks sad and replies, “I’m sorry.” His worry is that the acolyte will now spend his life agonizing over that moment of ecstasy and find the daily life of a monk unbearably dull by comparison—that he will become, in other words, the monk’s version of a drug addict, constantly looking for his next high. It’s critical to have gone to the mountaintop, and to have seen the Promised Land. But a true saint knows that the hard part is coming back down to the here and now, to the “few years in the second half of the 20th century,” as Martin Luther King put it. Ehrenreich believes that she foolishly abandoned her teenage quest to enter the world of other people, but I would argue that she never abandoned it at all. Her illuminating experience wasn’t really a secret; it was the animating force of her life, even if she never spoke about it. Where else would Ehrenreich have gotten the sense that she had a special mission, that her assigned task was to “hold the world together”? To her credit, Ehrenreich did not spend her life chasing and wondering about the flame. She spent it in the mundane tasks of socialist committee meetings, union rallies, and feminist marches, in the less intoxicating but more fruitful project of nickel-and-diming the world into social justice. Thank God. Living With a Wild God: A Nonbeliever’s Search for the Truth About Everything by Barbara Ehrenreich. Twelve.